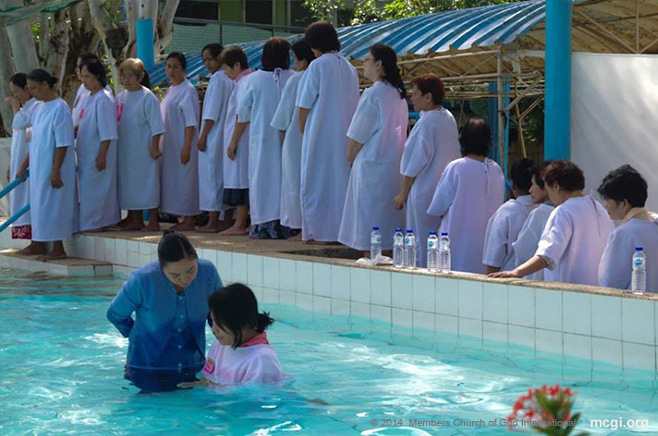 Read short testimonials of faith from some of MCGI’s youngest brethren baptized on February 26, 2016 at the Ang Dating Daan Convention Center in Apalit, Pampanga. I saw the difference between my old religion and now. I wasn’t active in my old religion, but it was only now that I have heard such teachings that are very good. Everything is in the Bible so you will really believe. Sometimes, I watch on TV, and sometimes I hear the teachings through my husband. He’s been a members since 2012. I just couldn’t attend to this because of my work as well. I can’t go absent just like that. I just filed a leave to be baptized. May the Lord continue to guide them in what they do that they may be able to help many people. I really wanted to already. At first, I was reluctant. My husband was first to become a member. After one year of watching on television, I liked it as well. That’s why I joined. Ever since my husband became a member here in the Church of God, I didn’t anymore worship in Catholicism. I was a Catholic but I didn’t anymore attend mass for about a year now. I watched the program at times when I didn’t have anything to do. That’s when I watched television. Whenever my husband would watch, I would too and so I saw the beautiful teachings of Bro Eli. Later on, I attended the Bible Expo and then the indoctrination. It’s unburdening. I was actually weeping inside the chapel when Bro. Eli lead the prayer. Then when I finally got baptized, all the emotional baggage that I used to carry got lifted. I hope that the Lord will always guide them for them to be able to continue in waving the flag of righteousness. I came to the point that it seemed like I didn’t have any God anymore that I believed in. I would wake up every morning and feel incomplete. I didn’t know what to do. Also, I have a son, and I want him to grow up with fear in God. I just felt so happy because this has long been overdue. It’s been delayed, so to speak because I’ve been hearing Bro. Eli since I was in high school. My father was the first to become a member here. I was still young then when he became a member of the Church of God. So I was able to watch Bro. Eli even then. That’s why I know also that all the teachings of Bro. Eli from the Bible are true. My father has been a member here since I was in elementary. He’s about 15 years in the church already. At times when we get together to talk, he shares with us, especially with me, the biblical lessons that he learns. There was one time that I really cannot forget. It was the last time we met before I attended the first indoctrination session. He told me what would happen when Christ appears. As I was looking at my father telling the story, it really left a great impression on me. I got really afraid of being in hell. I said, “For the rest of my life, while I still have hope, I want to learn the teachings of the Bible.” I also want my husband to be here, and my children, as well as my loved ones. Thank you because with the Lord’s help and the brethren’s, you are able to preach the teachings of God in every corner of the country, and not just here but in the whole wide world as well. I hope that they will be able to continue, and may they be given many more days that they may be able to go on preaching for our family to grow, so to speak. Their teachings are good, and really go straight to the heart. The doctrine about the four kinds of hearts really struck me. The first time we completed the indoctrination sessions, we [she and her cousins] didn’t get baptized. 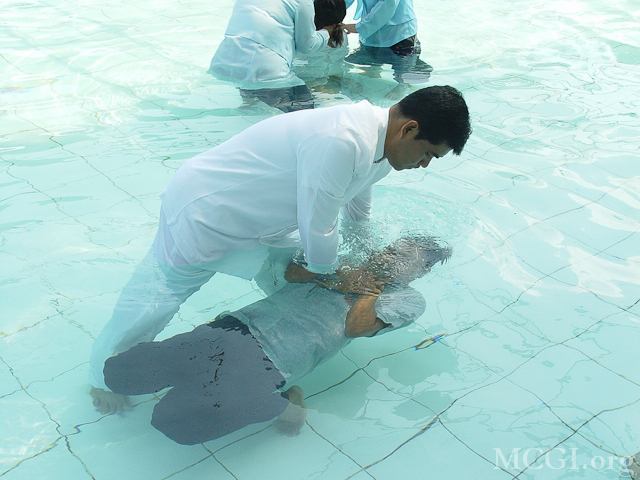 But when we got here in Apalit, this is when we realized that we should have gotten baptized before. My mother is already a member, and she’s the one who encouraged me to join. I told her that I would. Then after I was immersed, it felt so good inside. I said, “It’s okay.” I felt that my spirit was cleansed, and my sins are now gone. To Bro. Eli and Bro. Daniel, I hope that many more will become members in the Church of God, and that you’ll be able to teach us many more teachings. I heard true teachings in this religion. I also heard the one about graven images. In other groups, there is no God. In Catholicism, there are idols, while others don’t. That’s what got me wondering. I asked my father and looked in the Bible. That’s why I know that this religion is true, and so I joined here. My father would always bring me to Prayer Meetings and Thanksgivings. I also got to listen on radio while my father listened to Bro. Eli Soriano’s program, Ang Dating Daan (The Old Path). People of different nationalities would ask him there. When I got baptized, I felt that I had hope. I was glad. I was just really elated when I got baptized. After I got out of the water, it seemed like time slowed down. So I really feel so blessed now. For Bro. Eli Soriano, I hope that he will continue preaching the word of God in other nations, to those who haven’t yet realized that this is the truth. Others don’t believe; they still adhere to wrong teachings like worshipping idols. One time, I got into a debate with my classmate, the Top 1 in our class. I said that kneeling down to graven images is wrong. She got mad at me. I told her that other religions don’t have idols. She realized it and then one time I brought her to the locale and she heard the teachings. She goes with us every time my father and I attend Prayer Meetings. We just listen.